Cashel Community School would like to congratulate the students who completed their Junior Certificate programme this year. There were some excellent results across the board in what was a difficult and challenging year for all involved within our school community. The students were rewarded for all their hard work and efforts during the last three years. Mr. John Gallagher, Principal, paid tribute to the committed teachers , guidance counsellors, SNAs and ancillary staff in the School and acknowledged the support the school receives from the parents in their collective efforts to constantly promote excellence and a good work ethic in Cashel Community School. 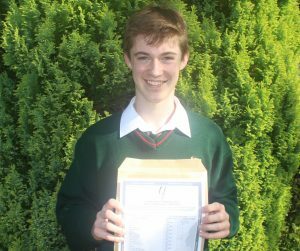 Mr Gallagher stated “we in Cashel Community School believe that success comes in many forms. 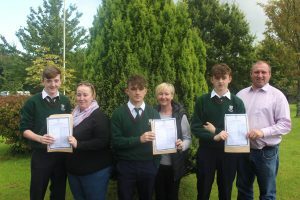 Whilst acknowledging the outstanding achievements of those pupils who scored very well in the Junior Certificate, we also recognise and applaud the excellent achievements of the many students who fulfilled their potential”. Mr. Gallagher went on to pay a special tribute to Kate Bourke who achieved straight A s in all her subjects;this by any standard is a phenomenal achievement. Finally, Mr. Gallagher went on to say “as a school look forward to seeing our students build on these results as they progress into the senior cycle and beyond”. Mr. John Gallagher (Principal), Jennifer Fogarty, Aoife Linehan, Jack Currivan, Fiona McGrath, Kate Bourke, Alma Casey, Eoin Foley, Ms. Mary Coman (Year Head). Jennifer Fogarty, Jack Currivan, Kate Bourke, Fiona McGrath, Alma Casey, Aoife Linehan, Eoin Foley with Ms. Mary Coman (Year Head). Aaron Moloney with his mother Elaine, John Marnane with his mother Lisa & Tomás Bourke and his father Martin. 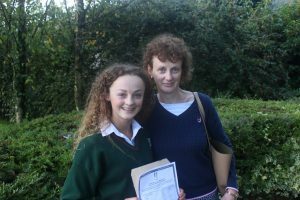 Kate Bourke with her mother celebrating her fantastic achievement. 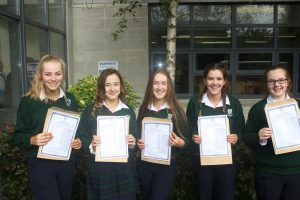 Kali Guilfoyle, Hanna Styrna, Fiona McGrath, Melike Cunlu & Aisling Maher.